← Are You Cut Out For Working From Home? Rechargeable vs. Disposable Batteries – Which is Greener and Cheaper? I am constantly amazed at the number of things that need batteries to operate. Apart from the obvious ones like cars and other vehicles, there is a plethora of tools, appliances, phones, watches, cameras, computers, toys and gadgets that are battery powered. Have you ever noticed that so many of these are not sold with the batteries when you buy them new? I find that really annoying! Like many people, I try to keep a supply of the commonly needed batteries on hand. I also keep them in the refrigerator which I have read keeps them fresher and longer-lasting. I’m not sure if this really works but at least I know where to find spare batteries. So the question these days is, which is better value for money – rechargeable or disposable? Another important consideration is which type is better for the environment? Let’s look at both these factors. The common alkaline battery is a single use power source. While they will last for 2 or 3 years, they can only be used once. When they run out of charge, they have to be thrown away, giving rise to them being referred to as disposable batteries. They will lose between 8 and 20% of charge each year, whether they are used or not. Rechargeable batteries on the other hand, can be recharged and reused up to 500 times, extending their life considerably. These days, they are available in most of the most commonly used sizes and can be used wherever single use batteries are used. You only need to buy new rechargeable batteries very infrequently, compared to how often you would need to buy disposable ones. While rechargeable batteries cost more to buy initially, they last so long before needing replacement that you quickly make up this cost difference and then have a definite cost saving for the remaining life of the battery. If you keep a set charged, there will be no delay when they need to be replaced. Keep all your batteries in the same place and mark them with the number of times they have been used and recharged, so you are never caught short. Some people argue that you use extra power when you need to recharge the rechargeable battery and so they are not as cost-effective as claimed. However, the small amount of power needed to operate a battery charger doesn’t come anywhere near the cost of continually replacing disposable batteries, so you are still ahead. So, now we know that you’ll definitely save money by buying rechargeable batteries instead of disposable ones but what about the environment? Which of these types of batteries is the greener option? It seems pretty obvious that if rechargeable batteries are going to last 500 times longer than disposable ones, they are the greener option straight away because there is less waste going to landfill. However, when it comes to how you dispose of different types of batteries, the environmental issue goes further than just the landfill problem. Older types of batteries contained a large amount of mercury which is toxic to plants and animals and should never be released into the environment. Modern batteries contain much less mercury but many varieties still have small amounts. 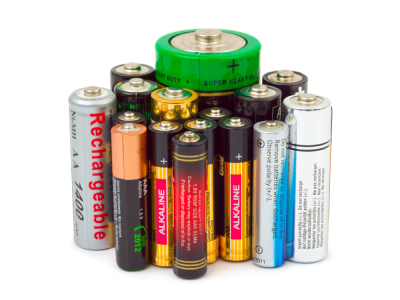 Alkaline batteries should be disposed of carefully and not simply thrown out in the general trash. They need to be taken to a special battery recycling center where they are disposed of carefully and safely. The small button-shaped batteries often contain cadmium, silver, lithium, mercury and other heavy metals toxic to the environment. Luckily, these elements are a valuable resource because they are expensive, so they tend to be recycled so the metals can be reused. Even rechargeable batteries can be toxic to the environment if not disposed of properly. They can contain cadmium although many now have nickel-metal-hydride which is less toxic. All batteries should be recycled because of the risk to the environment and most countries have recycling centers for this purpose. In Canada and the US, Call2Recycle is the place to go. There are other green advantages to using rechargeable batteries instead of disposable ones. Even the production of these batteries represents a saving to the planet. Rechargeable batteries have a reduced environmental impact of up to 30% in areas such as air and water pollution, non-renewable resources, and global warming. A breakdown of the cost savings between single-use and rechargeable batteries shows that you will pay about $20 for a pack of four AA rechargables and a battery charger for between $15 and $30. This means that the batteries will cost about $50 for their 500 or so uses. Even though the same number of disposable batteries would cost you considerably less – maybe as low as $2, because they are single use, to get the equivalent amount of power, the cost would be $1,000. So the green option for batteries is definitely rechargeable ones and fortunately, this is also the best way to save money! So, what kind of batteries do you use and why? I’ve used rechargeable in the past and liked using them quite well. Having three little ones means using a lot of batteries for all of their toys. Right now we use disposeable, but will probably move back to rechargeable in the future. I am glad to hear that. Getting back into that habit will save you money and the planet. Maybe you can try non battery toys too. With all the remotes and gadgets in the house we go through batteries like water. Never really thought of the difference much as for as greener but I knew we were saving more money on rechargeables. The only problem is just seem we never had enough recharged when we needed them so we would end up going out to get disposables until they charged. Maybe the key is to always keep some charged and handy. Buying a few more chargers and batteries might be a way to keep up. I have read that if you keep them in the fridge they will keep their charge longer. Mostly rechargables – we use them for the WII, the camera, etc. I”m a firm believer in them! Good stuff. We are too. We have two chargers too which help keep with recharging and having spares. More businesses should have battery recycling regardless of the type used. Nearly everyone in our office has a wireless keyboard/mouse, and those go though batteries very quickly. That is a great idea. I wish companies put more emphasis on this. It is so important. I used to use rechargeable all the time. But my digital camera is very picky about what batteries it will accept. Buy the wrong brand or technology and it won’t even turn on! Since that is the only thing I have that hours through batteries faster than once a year, I don’t even bother any more. Having to have certain batteries for things does piss me off. It is not green at all. I guess it comes down to companies wanting to make more money. We use rechargeable for all toys (yep, we still have toys around the house it is just that their nature changes). I was also telling my students about the wind-up radio. Have you seen one in Canada? It was invented by a guy here in the UK because he heard that in South Africa people are illiterate and too poor to buy batteries for radios – so they can’t follow the news and cannnot be educated in democracy (or even simply informed about events). So here came the wind-up radio – it works without vatteries. Have a look; I have one and listen to it in the batroom. That sounds really cool. I think I can get them here at outdoor stores. We have a wind up flashlight which is great for camping and emergencies. I think the technology has improved since your last experience so I would recommend trying rechargeables again. We used to have a battery recharger and I can’t remember why we stopped using it or what happened to it. I think I’ll keep my eye out for another one because you make some really good points about their benefits. I imagine I’ll still keep a few disposables on hand for those times when you can’t wait for the recharging process. It doesn’t have to be either/or. That is true. Disposables would be handy for emergency situations when you don’t have access to power to recharge. what do I do with the Batt.?. to store them to keep them from shorting out and burning my house down 9 volts can short out if you touch both poles if you have them in a baggie they can touch each other.! So can the flat ones. Your assumption that 1 disposable battery energy = 1 rechargeable battery cycle is, in my experience, false – which means your economic analysis is incorrect. Rechargeables are still likely “better” – but how much better is the question and does it justify the hassle of dealing with more frequent changes, etc. Also, what is the relative environmental cost of producing and disposing of rechargeable batteries vs. alkalines – separate from the use costs (1 use vs say 500). While I ‘suspect’ rechargeables are better, I’m interested in how much better and is it really as significant as the hand waving analysis I’ve been able to find so far?